This is a long post, but an important one for me in finding another part of myself in the Oakland Museum of California. So that I wouldn’t miss the museum over the summer months when there are no school tours, I made sure that I drop by the History Gallery at least twice a month. I also spent a couple of Sundays doing some unscheduled pick-up tours for friends and visitors. So, whether or not I was on the schedule, I showed up. The first Sunday of the month is busy because it is free to the public, and during the summer, extra docents are always welcomed on those Sundays. Adult touring was an easy way to add to my history knowledge. Adults who show up on the weekends are usually geeks, full of facts and stories they have gathered during their lifetime, eager to share their expertise and experience. 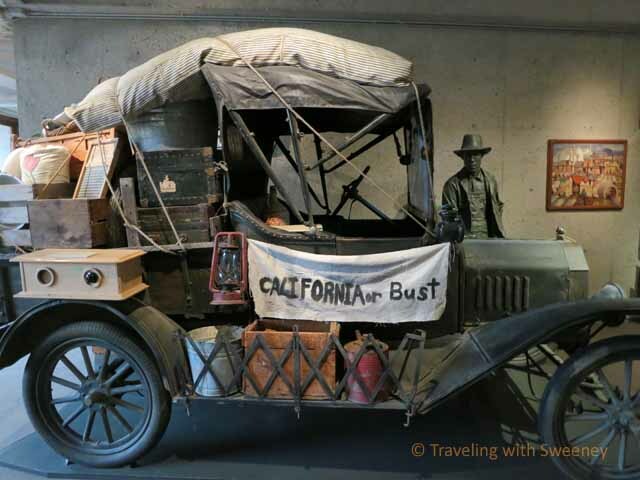 If I got lucky and someone who really connected to one of the exhibits joined my tour, I often learned personal details and stories I could have never read about in my many notebooks at home. 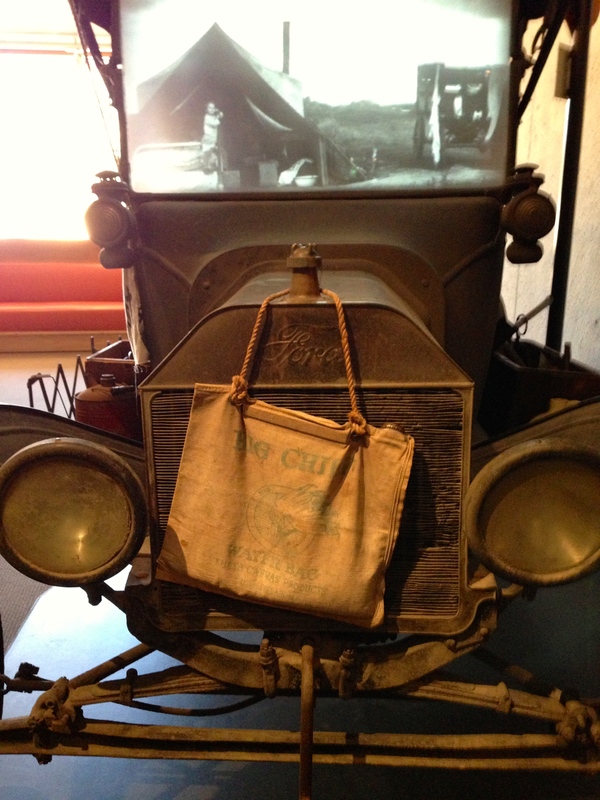 I met a woman who remembered crossing the country from Arkansas in a Model T Ford. It was her responsibility to fill with cold water the little canvas bag that hung on the radiator to keep it cool. As she recounted her experience, I could see her as a young girl, remembering her father’s words and his hands as he guided hers to replace the water bladder on their car for her first time. Her eyes were shiny as she told me the story. She had “found herself” in our museum. This woman was not from California; her family had decided to return to Arkansas, not being successful in finding employment during the depression. But this is what we strive for—not only to educate people about California History, but to help them discover their own. By the end of the summer months I was certain that I wanted more opportunities like this: I wanted to be able to tour the entire gallery, to talk to more visitors, to watch more people connect. I put in my request to the Docent Center for the next Gallery Training. The Oakland Museum is unusual in that it has three disciplines in one building: Art, History and Natural Science. At this point the Natural Science Gallery was being renovated. Art and History had already had their renovations a few years earlier. 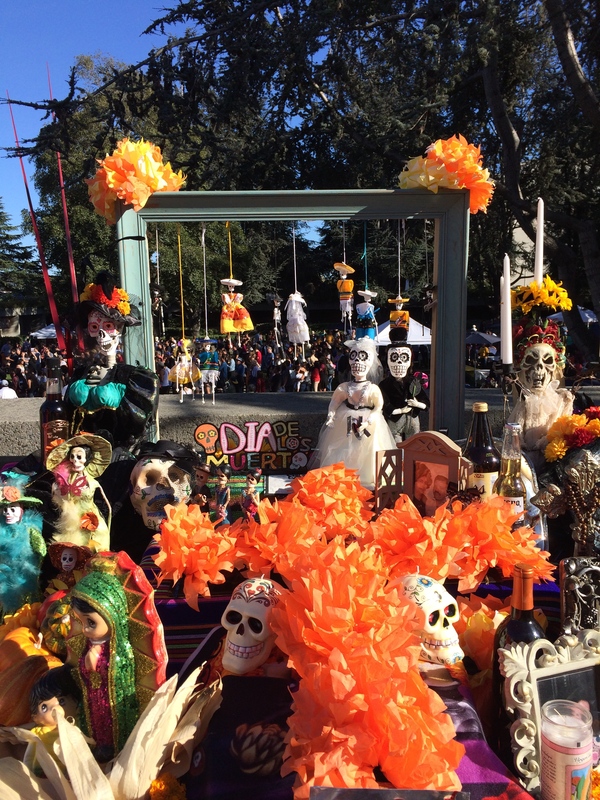 It was unclear when that next training would be held, but the next offering for any training would be the Dias de los Muertos—The Days of the Dead—which would be held over four weekends in the fall. I was new to this exhibit as a touring docent, so I would be required to attend all of the training sessions. As a teacher, I used to take my third-grade class to this exhibit every year and owned a copy of the museum’s training notebook. Urged by my friend Kristi Rasmussen, who was very familiar with the holiday, I had already begun my own modest altar at home during this season. At least a decade before my home altar, I celebrated in my third-grade classroom, where we decorated paper skulls and made a collective altar with photos and drawings of dogs, cats and birds who had passed on, and family ancestors who the students hadn’t met. The altar was an eclectic mix of dog collars, a drinking bowl or two, catnip toys, a baggie of kibble, favorite pet photos and drawings. Then we included clothing items from the family—grandpa’s old hat, great grandmother’s quilt and button shoes. Each year, I realized that this was an important experience for the students, but I did not yet realize that this would be an important experience for me. My first altar at home displayed a photo of my maternal grandparents, Paul and Lucile Kelly and a note to me from my father. When I moved to California my father sent me little notes from his office. Sometimes he included two $1 bills. Later the bills became checks for a plane ticket so that I could fly home for a visit. My grandmother, at 85 years, took me to Washington D.C. for my first and only trip there. I was 17. That was 48 years ago. 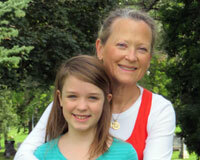 This year I took my granddaughter, Amara Sky Valley, 10, on the same trip. Here is a photograph of me with my grandmother and Congressman Don Clausen in 1967. My first altar sat on top of a bookshelf, and consisted of just this grouping of photos. If a photo of a deceased person contains the photo of someone living, that photo cannot be used on the altar, or the living person needs to be cut out or covered up. I also included a photo of my dad’s best friend, Bun, and a couple of books I used in my third-grade class. For several years, I didn’t do much more than this. By the time I signed up for the training, I had been casually celebrating the Day of the Dead for ten years. But feeling well prepared was a mistake on my part. I was familiar with the holiday, but certainly not with all of the cultural nuances and the history. 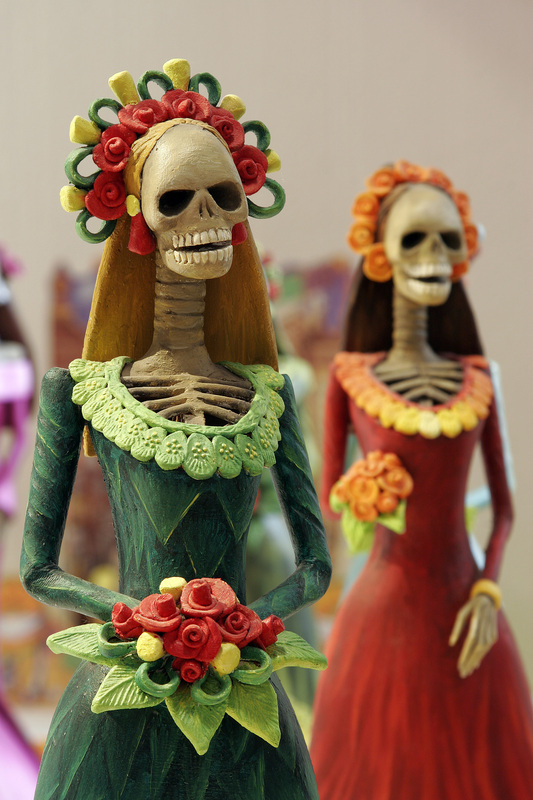 Dias de los Muertos has a history of 3000 years, dating back to the Aztecs. In the Aztec culture, there were two celebrations. One was Feast of the Little Dead Ones and the other the Feast of the Adult Dead. These two appeared to have been combined. The Spanish tried to eradicate the Aztec celebrations in the 1500’s, when the Spanish, led by the Catholic Church, conquered the land that is now Mexico. The Spanish missionaries observed All Saints’ Day and All Souls’ Day (November 1st and 2nd). 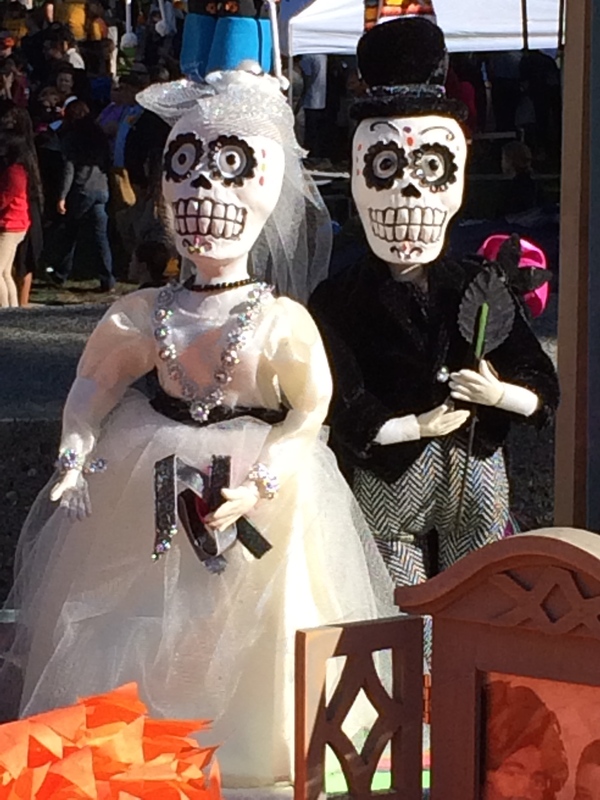 The Mexican people began incorporating their Days of the Dead into the Spanish celebration’s time frame. This celebration, originating in Mexico and Central America, is a time when families and friends and community come together to remember the lives of loved ones. During the 1960’s Chicano movement, Days of the Dead became popular in California. The celebration is a way to embrace death as part of life and celebrate the passing of loved ones. The traditional practice is based on “a belief that the spirits of dead relatives will return to their homes on the evenings of November 1st and 2nd. To welcome the spirits as honored guests, family altars are cleaned and freshened or new altars are built as early as October 30th to entice the spirits back home. Political and social art became an important part of the celebration, often poking fun at things that people think are important. This form of art was invented by José Guadalupe Posada and made popular by Diego Rivera. The art of the altar has been an important component to the celebration ever since. One of the most popular is “La Calavera Catrina,” a character that Posada invented to make fun of the upper class during the reign of the Mexican President from 1884 to 1911. Here she is with her enormous hat, symbol of the accoutrements the upper class thought essential. Posada incorporated other symbols of the upper class into his characters and drawings, including cigars and party accessories. I was also unaware that this celebration didn’t just involve the family, but the entire community. The bakers prepare pan de muertos and families prepare “sugar skulls.” Some families are know for their sugar skulls, made of sugar poured in a liquid mixture into a ceramic mold. When they are solid, they are decorated and often the name of the loved one is written on a piece of foil on the forehead, as in this photo. A boy might even have a skull made for his girlfriend, with her name. The names of the living on the skulls are to remind us of our own mortality. 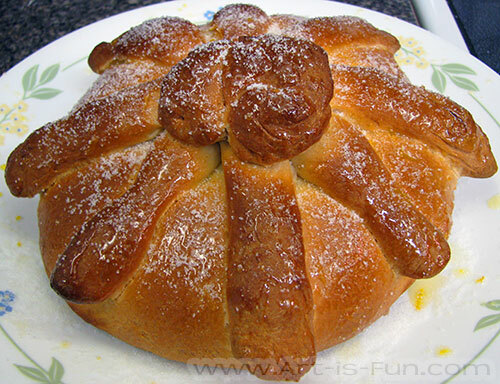 The pan de muertos, or “bread of the dead,” which varies with the baker or the region, is baked for the weeks leading up to November 1st and 2nd. The bread is eaten on those dates as well as at the gravesite or altar of the ancestor. During the training, I also learned that this is not a holiday that belongs to all Spanish speakers, as Dias de los Muertos originated in Mexico. My son-in-law, who is from Bogata, Colombia, does not celebrate the holiday. He knows that some people do walk to the cemetery in his community, spending the night of the celebration at the graveyard. His family does not have an ofrenda at home, nor do they visit the grave site of their ancestors. In the Jewish tradition, the anniversary of the death, the yahrzeit, is observed. But this observance is generally somber and incorporated into the Friday night Shabbat service as a reminder that the deceased are no longer with us. In contrast, my observation of the Hispanic community during my training showed me that this anniversary is a celebration. It is about honoring family members who have passed and keeping them alive in the hearts of the living. It is about telling all the stories about Uncle Harry or Julius, in my case. Though I do not have a Hispanic background, I have come to love this holiday. It gives me an opportunity to celebrate the lives of these people I admire so much. Even though they have been gone for years, I still want to remember them with joy. Over the years I watched my friend Kristi’s altar develop: Her father-in-law’s hiking shoes, her brother’s favorite food, followed by her own father’s 78rpm record. Food, beverages, marigolds, and calacas from the trip to Oaxaca and her own collection over the years. 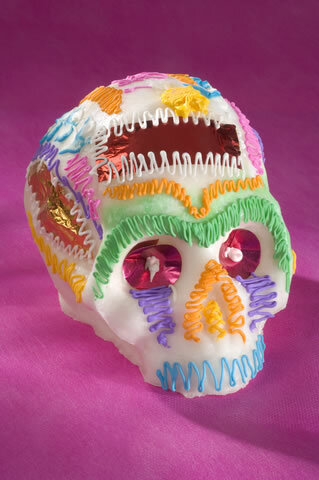 The pan de muertos, tamales, fruit, candy and of course sugar skulls. When Kristi’s mother passed away, Kristi added a beautiful couple dressed in wedding attire to represent her parents. All these items are offerings to entice the spirits back to their family home. Families put out special food, less seasoned and simpler, for the children whose spirits are expected to arrive on October 31st or early on November 1st. Traditionally, some of the food offerings are carried to the grave sites on November 2nd when the families clean the graves and place flowers and the food on them. While in Oaxaca, Kristi and her husband walked with the community to the graveyards. There was hot cocoa to drink and everyone gathered: the children, aunts and uncles, grandparents and hopefully the spirits of the dead returning to celebrate with their relatives. Kristi and her husband were particularly dazzled when everybody joined the parade carrying lit candles in the dark, the leaders strewing marigold flowers, which covered their steps, to lead their ancestors back to the graves for the final goodbye of the year. After the training was complete, I saw a cartoon on TV about a young girl who had lost her mother. She is on her way with her family and community to the graveyard celebration. When she arrives at the graveyard, she watches the skeleton of her mother, dressed in a flowered skirt, twirling, and as she twirls in front of her daughter, she comes alive and her skeleton is covered with healthy, glowing skin. The little girl throws her arms around her mother and falls asleep in her arms. When she wakes up, the spirit of her mother is gone, but she knows she will see her mother the following year, and she is happy. Watching this cartoon, the power of the holiday hit me, and I decided to begin fully celebrating myself. This little girl knew that she would be able to feel the presence of her mother every year. The culture I was raised with emphasized that you would never feel that again. This is a different way of approaching death from the way I was raised. But I began to understand that if I can imagine that I will continue to feel the presence of my father year after year, how much better to look forward to that than that I will no longer ever see him again. With this realization my altar began to have more importance in my home. 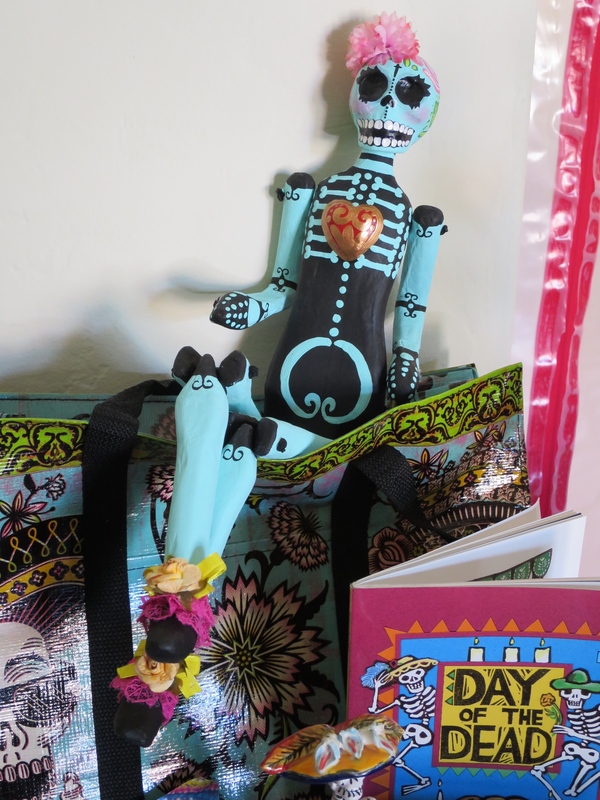 I added a piece of fabric to cover my bookcase and soon I began collecting calacas and Day of the Dead decorations from a shop on International Blvd. in Oakland. The colorful artifacts of this celebration cannot but make you smile and feel cheerful. My altar has become an art project that grows year after year, migrating from the top of my bookcase to covering one end of my dining room table. And as my celebration becomes more elaborate, I notice more altars in Hispanic restaurants, in shops in the Mission area of Oakland, as well as in homes. One of my daughter’s classmates at Berkeley High had an altar in their home. The house was small, warm and dark, and you couldn’t miss the round dining room table, which you saw as soon as you entered, and which each year held the altar. The altars I had seen in my friends’ homes were “properly” situated in their own space and certainly not in the site of other activities. In this Hispanic home, the altar was part of everything. “When Tia Maria comes, she wants to be with everyone and see what we are up to,” the mother explained. The children sat around the table doing their homework, and on occasion they would try to grab a Mexican wedding cookie or other favorite food of Tia Maria’s. The children would balk and complain, “Tia Maria won’t mind!” “No touching!” Mama, who had grown up in Mexico, was serious. Although her children were being raised in the United States and were very American, very Berkeley even, she wanted to keep this tradition. 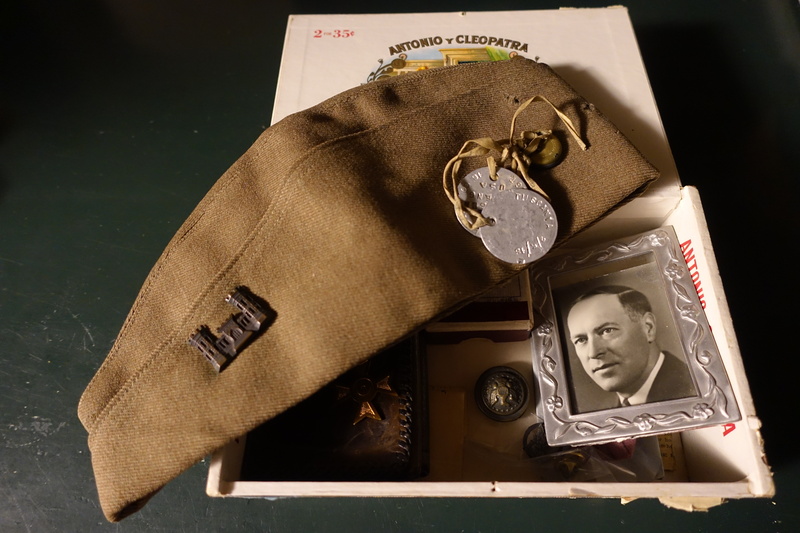 Paul Kelly’s cap from the first World War—the pin designates that he was stationed in Europe as a member of the 20th Division of the Army Corps of Engineers, the Forestry Division producing some 200 million feet of lumber for France. This lumber built 20 million square feet of storage and 800 miles of standard-gauge rail lines. Learning about the altars that Oakland’s Hispanic community made honoring their family members has given me the opportunity to remember my parents, grandparents, aunts and uncles in a spirit of celebration of their life, rather than the sadness of their death. While my home altar was developing, I was learning about the Oakland Hispanic Community that would be displaying their altars in the Day of the Dead exhibit at the Oakland Museum in 2011. The lead artist Alicia Diaz worked with grieving families at Clinica de la Raza in Oakland. She worked with 25 families, helping each create a shoe box diorama, which became an entrancing display for all the children who came through the exhibit that year. In each shoe box, a family created a scene about the person who died. My favorite, of a child’s passing, depicted the child as an angel over the family. The scenes showed the child’s favorite toys, food made from fimo, tiny very personal details. There were about 25 to 30 shoe boxes, all attached at eye level. Later, the only difficulty was moving the group of touring students on to the next viewing area. Each box was riveting, the scenes just as often funny as sad. Alicia came to the museum and met with those of us who were being trained as DOD docents. I did not know many of the members of our group and I soon learned why. Being a Gold Rush Guide, I felt that I had some familiarity with how to approach this exhibit. I was wrong. Many of the docents had not only participated before, they had participated for their whole lives and many had grown up with ofrendas in their homes. Most of the group also spoke Spanish and most of the artists were Hispanic as well. I was definitely a newbie in more that one way. I was going to have a very well-rounded experience. Most of the DOD Guides were new to me; some only toured for this exhibit and most spoke fluent Spanish. I did not, and wish I did. Once our training was complete, the schools with the largest Hispanic populations flooded our Art Gallery during these weeks. No one in the Gold Rush Touring Training lived through those events. As Alicia began to tell us about the families she helped at Clinica de la Raza, I realized this was an extension of who she was culturally. This was not a job for her. She was part of their families and they a part of hers. Helping them celebrate the losses they experienced was no different than celebrating her own losses. “My only problem with this project was getting it ready for this exhibit. I did not realize how invested my patients were going to be and they put so much of themselves into each shoe box that they just couldn’t be done,” explained Alicia with the pride in her community showing in her eyes. My very first viewing of the altars was as a classroom teacher on a field trip. I remember several of the altars, but remember more watching the children. Now I was going to be a student and learn about the exhibit. I was also going to have the opportunity to meet the artists and listen to them speak about their altars from their hearts. The altars are all about heart. 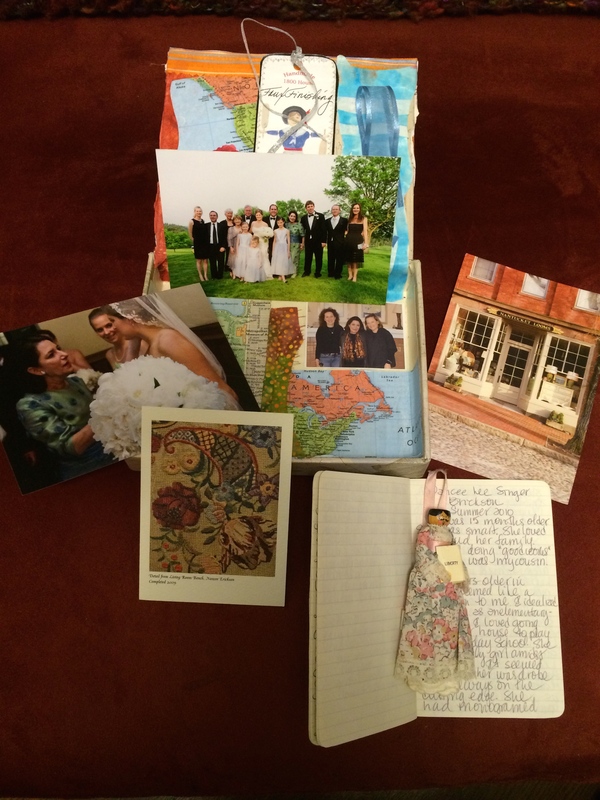 I began to think about making a box for my cousin Nancee, who had died unexpectedly. We grew up together in Portland, more like sisters these last years as we both had moved to the Bay Area in the 70’s. I lined the box with the maps showing both coastlines, a ribbon of her favorite color glued alongside. 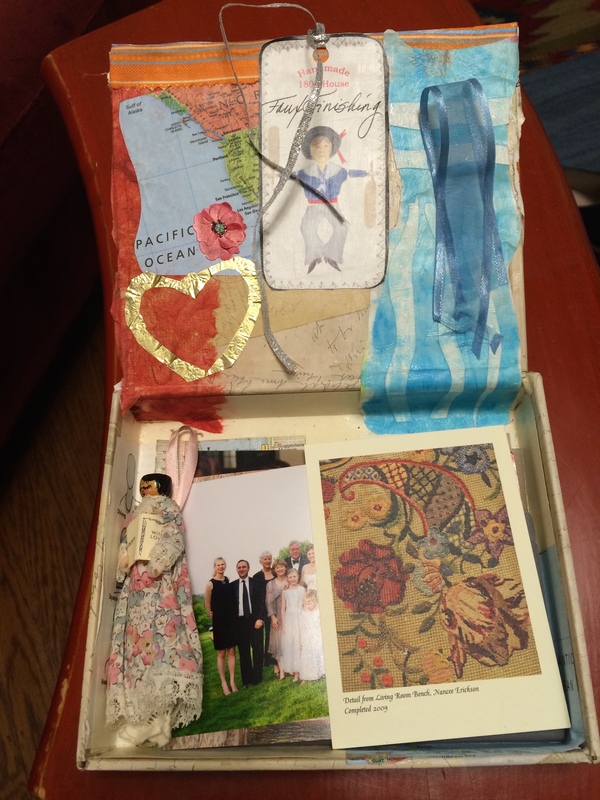 Then I placed the photos, the journal and pieces of paper and the doll inside. I added a silver ribbon to tie the box shut. I placed a photo on the lid of me with my sister and Nancee from about six months before she died. By the time I finished I was no longer sad. I had a little bit of my cousin right next to me, and the box stayed out on my desk for the next year. In writing this, I realized that she has been gone for four years and I am finally able to tuck her box away with my other Days of the Dead items until next fall. Or I can have her at my desk for a while to remember her, the wonderful smells from her kitchen and how much she loved her shoes! This was the beginning of making a more complete altar of my family. I am working on a box for my parents, my grandmother and one that represents the rest of my family. At the museum, when I will look at the ofrendas each year, whether I am touring or not, I will come from a different place: from my heart, rather than my head. 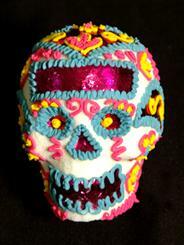 In October 2011, Dias de los Muertos was curated by Patricia Rodriguez at the Oakland Museum of California. 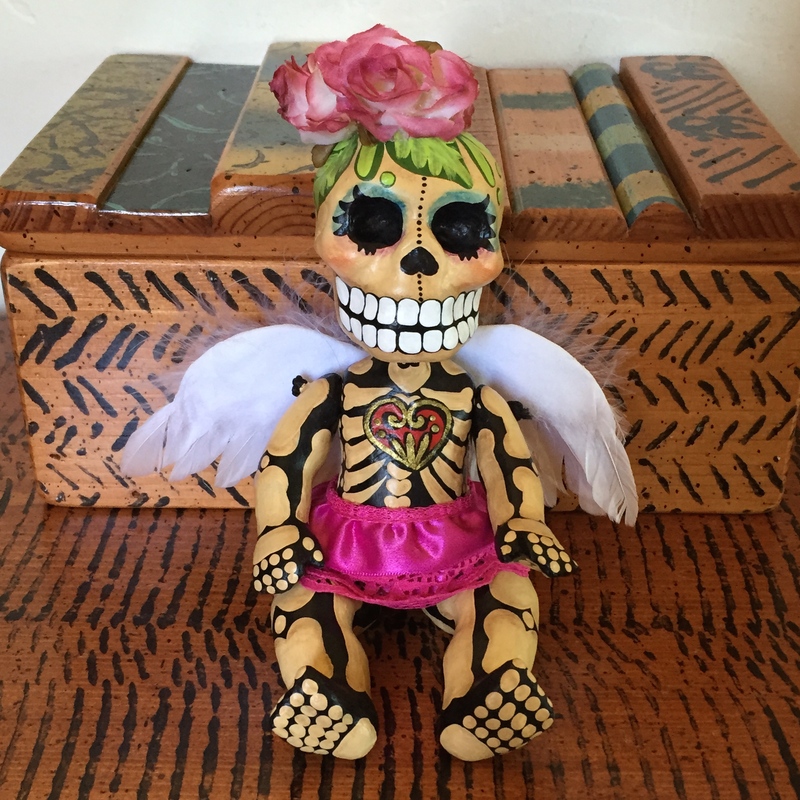 It was titled “Love and Loss.” 14 artists and three community groups created ofrendas and altars, with personal stories related to Días de los Muertos. Because the museum is community-based, many local artists wanted to participate in our celebration. Unfortunately, we had room only for 15. Xochitl Nevel Gerrero and Roberto Guerrero, in their installation “The Dance of Struggle and Love,” honor their long-time friend Rebecca “Ruby” Pacheco. Ruby loved life as a teacher and spent most of her life as a community social justice activist and artist. Joaquin A. Newman honors his maternal grandfather Francisco in his installation “The Ring.” His grandfather was a World War II veteran, a family man and a coach who trained boxers. The lessons he taught his fighters, family and friends went beyond the ring and continue to guide those who remember them. Lead artist Alicia Diaz worked with grieving families from the Clinica de la Raza, Casa de Sol and Sutter Health, VNA Hospice in Emeryville to create nicho (niche) boxes honoring the lives of departed loved ones. Consuelo Jimenez Underwood honors her father and the struggle of immigrants crossing the border. It has been a privilege to learn through these men and women and grow from the experience. I am proud to be a docent at such a vibrant community-based museum. Finally, finally, I understand Dias de Los Muertos a little bit better. Thank you Em. Really enjoyed learning more about Dias de los Muertos, especially the origins of the Museum’s celebration and the families who still create their ofrendos. Thanks, Emily. Thank you, Kathleen. This is quite a journey! 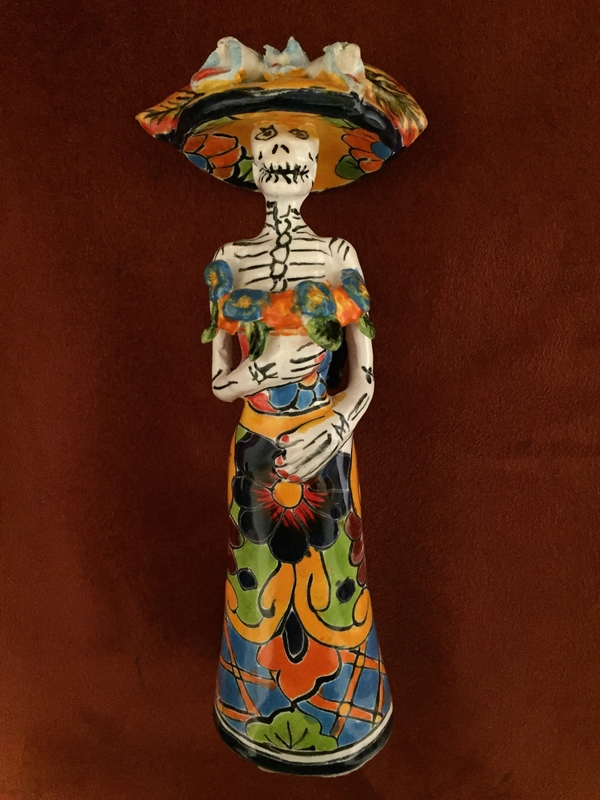 Emily’s essay exemplifies what I like about Dia de Los Muertos – it is personal, poignant, informative, and with the right mix of reverence and humor. Isn’t that the way we all want to remember our departed loved ones? I don’t go to the Fruitvale celebration every year, but the ofrendas there, even in the midst of the Safeway and State Farm displays, are my favorites. Much more meaningful, and I think more in the spirit of the tradition, than the sometimes elaborate constructions that are part of the Museum’s celebration. Thank you Pete, for your comments. I will go to the Fruitvale celebration this year and see the other side of the spirit. Thank you for sharing, Emily. The more I learn about Dias de los Muertos, the more my appreciation for all its rituals of remembering and honoring deepens especially since there is nothing like this in my own culture/background. Kristi has inspired me to make an altar, too, which stays on top of the piano all November. When my sons are home for Thanksgiving, I find a time to gather everyone around and share a story about one of the grandparents. I love your cigar box altar to your cousin and am sure it brings you comfort and even joy. I love it that we all have this connection. We are lucky to have all learned so much about other cultures and get to add them to our lives! Thank you for your story. I am going to start the story telling tradition this year. I like it! 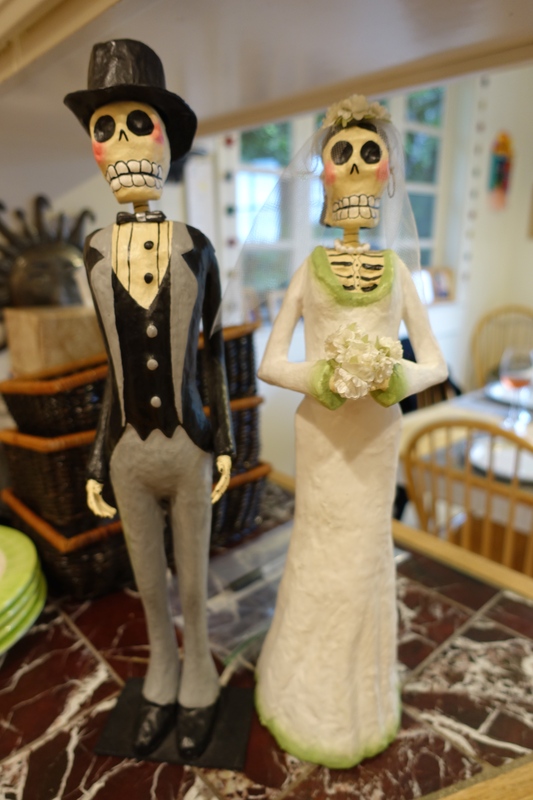 I loved reading about your personal connection to Dias de Los Muertos. And it inspires me to create an altar to honor those I’ve lost. Thank you. What a great journey you are on Emily. Thank you for sharing. I remember your third grade altars. You have definitely inspired me to think differently.